You know I love a good DIY project and this one is so much fun! 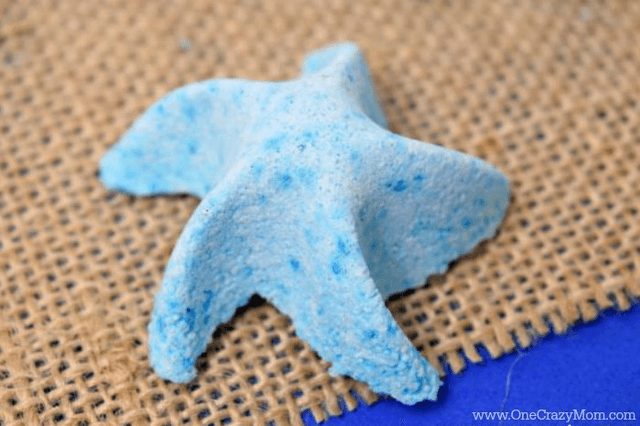 Today, I am showing you how to make these Homemade Starfish Bath Bombs with the easiest Bath Bomb Recipe. Now these are super cute for the kids, but you can use any mold you want and make them more “adult” like. I don’t know about you but I love bath bombs! Everyone enjoys these and they make amazing gifts! We made some adorable heart bath bombs if you would like another DIY Bath Bombs Recipe. You will be surprised just how easy these are! Not only are they fun to make but they are very simple and inexpensive. Bath bomb molds come in all shapes and sizes. You can purchase a ton of molds online. However, don’t forget to look around the house too. Silicone molds work best because they are easy to take out. 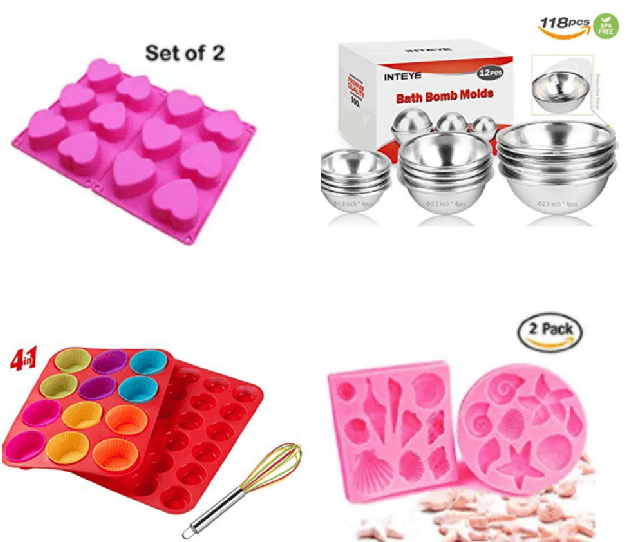 Did you know you can even use muffin tins or mini muffin tins to make bath bombs? Most of you probably have silicone muffin pans on hand. I like to use different colors and shapes for holidays or different occasions. I love the stainless molds to make the large round bath bomb molds that are so popular right now. These also make really good gifts! It’s so simple and budget friendly. Learn how to put together these DIY bath bombs quickly and easily. Can you make a bath bomb recipe with cornstarch? Yes but it will change how the bath bomb fizzes. What is the purpose of cornstarch in bath bombs? Cornstarch can be used as a filler in bath bombs. The amount used will change how much the bath bombs fizz in the water. Can you make a bath bomb recipe with epsom salt? Yes! It would be perfect for tired and achy muscles. What can be used in place of citric acid? While bath bombs made with citric acid and baking soda provide the most fizz, there are alternatives. Lemon juice can be used in place of citric acid. Just note that it will not provide the level of fizz that citric acid does. Cream of tartar can also be used. Just experiment until you find the amount of fizz you prefer. Where do you find citric acid? We purchase citric acid online. It’s reasonably priced and I can keep some on hand for all our DIY projects. We area always making something. your favorite Essential oils – we love to use Lavender essential oil here. 1. Grab your small mixing bowl and pour in the citric acid and baking soda and combine together using your whisk. Once you’re happy with the mixture grab your pipette and fill up with water. 2. Squeeze a little bit of water out at a time and mix quickly to avoid the mixture from fizzing up. You want to add in water until the dry mixture is the consistency of wet sand. 3. Now add in 3 drops of blue food coloring and mix until it’s stirred into all the bath bomb mixture. 4. Now it’s time to fill those molds. 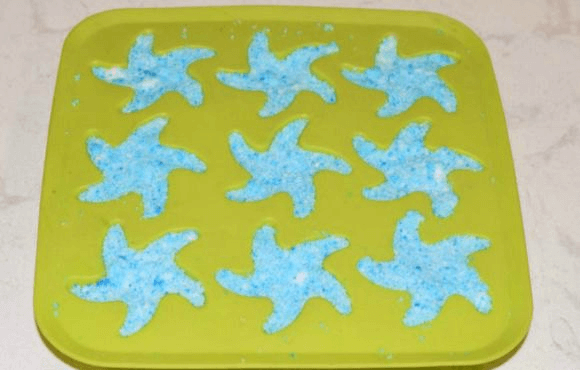 I chose an adorable Starfish mold that was perfect for this project. Using a spoon, grab the mixture and pour it into your molds and be sure to pat it down firmly. Allow to dry for at least 2 hours before removing from molds. 5. Once removed store them in an airtight container in your bathroom and use at bath time. These are perfect for adults and kids and can easily be used by dropping one or two into the bath tub. 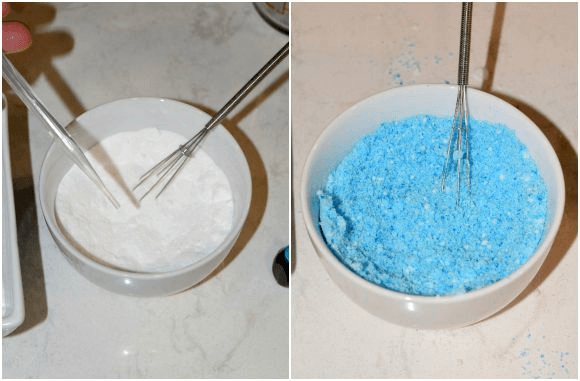 Homemade bath bombs are so simple! These are just the cutest and the kids just love them! Now I made me some too because Momma needs to relax as well! 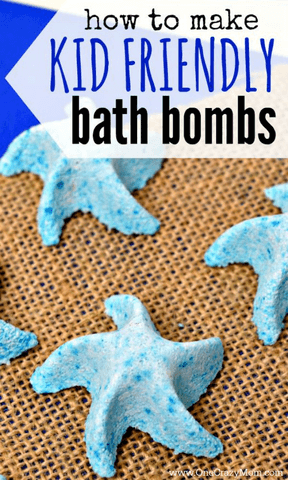 Make your own bath bomb today! Everyone loves bath bombs. It’s one of the beauty products most everyone enjoys. Homemade bath bombs are so relaxing. This fizzy bath bomb recipe is so fun! 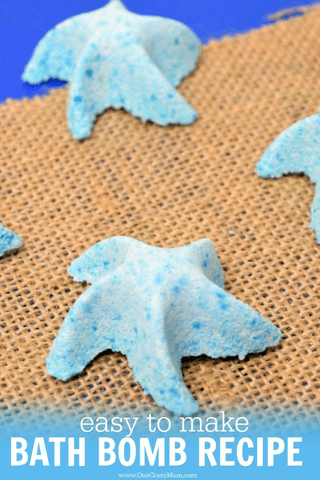 You will have just as much fun making these bath bombs as you will using them! 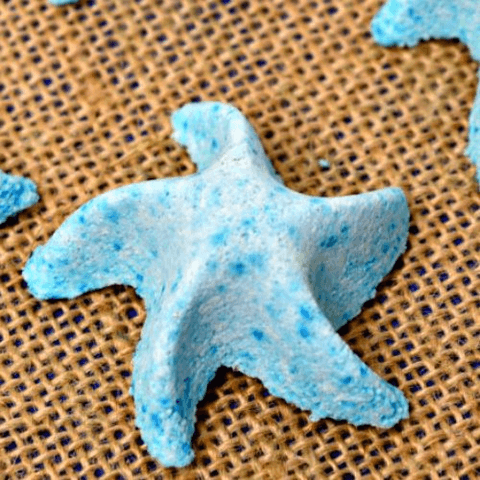 Gather the kids and let them help make these fun and simple DIY bath bombs! This is the best bath bomb recipe! When do you mix the oil in?